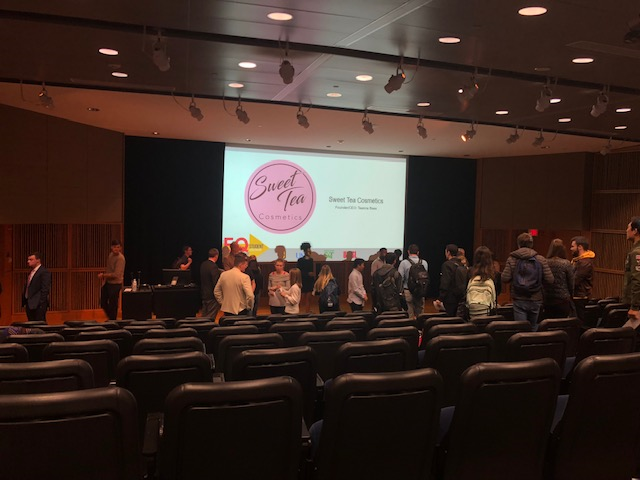 The 15 Entrepreneur Quest Pitch Competition teams mingle after presenting their pitches in Monsanto Auditorium on Monday, Nov. 12, 2018. From Shark Tank to Startup Weekends, entrepreneurship is a growing craze in the nation. More than 25 million Americans are starting or running new businesses. The University of Missouri is the latest to encourage innovation on campus. KBIA’s Betsy Smith has more on MU’s new Entrepreneur Quest Pitch Competition. Over 100 MU students and faculty members gathered in Monsanto Auditorium Monday morning at the first Entrepreneur Quest Pitch competition. Fifteen student teams ranging from freshmen to doctoral candidates pitched solutions for sports, agriculture, business and more. But only ten of these teams are continuing forward in the spring competition. One pitch really seemed to resonate with the audience on Monday morning. It’s an app called SL.App. Chase Scanlan, one of the SL.App team members, said its purpose is to make sub-leasing less of a headache. Scanlan helped create the app idea with his twin brother, Ross, and other team members James Yoon, Jake Eovaldi and John Wiehe. The Sl.App team won first place in a recent Startup Weekend contest in Columbia, but the EQ Pitch competition was their first time working with MU on their endeavors. Greg Bier, the director of the Entrepreneur Quest program, said EQ’s goal is to encourage more college students, like the SL.App team, to innovate. Bier said MU is also moving forward with its own quest to expand entrepreneurship on campus. “We're working to create some type of entrepreneurship nexus on campus, one place that all of the students would know if they've got any interest in entrepreneurship,” he said. After the final pitch was presented, the audience voted on the crowd favorite. The next morning, the SL.App team learned that they won the title of Crowd Favorite, and with it, a $500 prize. But they aren’t celebrating just yet. Ross Scanlan said there’s tough competition. “There are a lot of other good pitches and other company ideas in the top 10,” Ross Scanlan said. The ten finalists will take an eight-week course in the spring to refine their ideas. Then, they have another pitch competition—this time with a prize of $15,000 for the first place winner and $10,000 and $5,000 or the second and third place winners. Moving on means moving up to yet another competition, but this one would be with the winning teams from other schools in the UM System for even more prize money. Until then, the SL.App team is focusing on ways to improve their idea—and hopefully win $30,000.